If you, as CEO can’t succinctly articulate your strategy, how can you expect your managers or staff to do so? 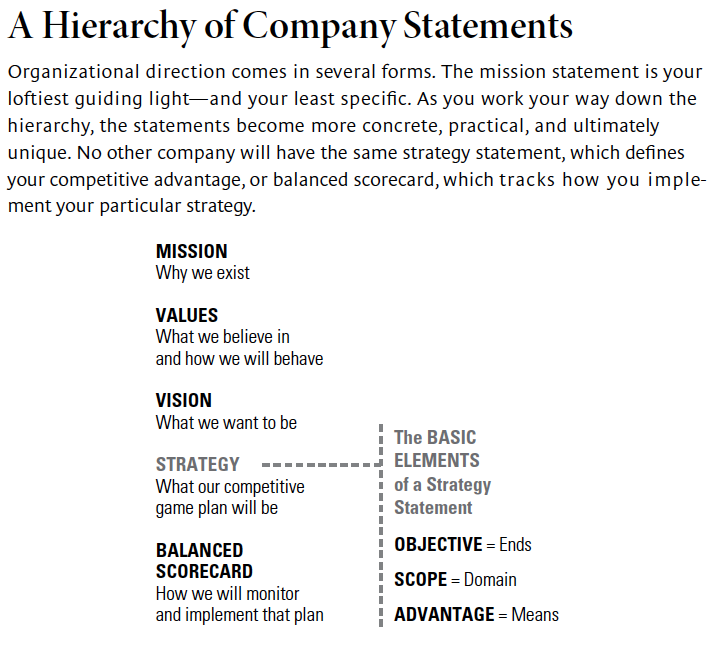 Collis and Rukstad offer the following hierarchy of company statements as a guide for the use of the key terms used in strategy. The correct use of which will result in a concise strategic statement which covers scope, objective and advantage. In this example you can clearly see what the goal is, what the advantage is, who the exact customer is and how they are going to deliver it. In the article the authors use a great analogy where they describe an organisation as a collection of iron filings sitting on a sheet of paper. “Think of a major business as a mound of 10,000 iron filings, each one representing an employee. If you scoop up that many filings and drop them onto a piece of paper, they’ll be pointing in every direction. It will be a big mess: 10,000 smart people working hard and making what they think are the right decisions for the company—but with the net result of confusion. Engineers in the R&D department are creating a product with “must have” features for which (as the marketing group could have told them) customers will not pay; the sales force is selling customers on quick turnaround times and customised offerings even though the manufacturing group has just invested in equipment designed for long production runs; and so on. This is a great read for any CEO or manager and can be downloaded from this blog.